Ever wondered how some people are able to maintain great hairstyles like the slick back hair style flaunted by Michael Douglas in the movie Wall Street? Have you been thinking lately of getting into the groove with a classic slicked back as portrayed by Jake Gyllenhaal in the movie Prisoners? The truth is that slicked back hair styles have existed for a long time and thanks to some of the best pomade for men, these styles are never going to fade. There are a variety of hairstyling products available in the market today that are used for fixing the hair but pomades really stand out. When pomades initially were introduced, they were mostly made using apple peelings and boar fat but today, pomades contain a more effective formula as well as ingredients. How to apply the pomade ? The best way of using pomades is applying it to wet or damp hair. Hence, it is always recommended that you have a bath first and then apply your chosen best pomade for men. The fact is that wet hair allows the pomade to settle down evenly on wet hair as compared to dry hair. Obviously, pomades can be further softened by using blow-dryers. So how do you find the best pomade for men like me? There are plenty of brands and it can be quite a confusing shopping experience if you don’t know what you are looking for. So, we have researched and prepared a list of 7 top pomades for men that will definitely enable you to make the right choice. 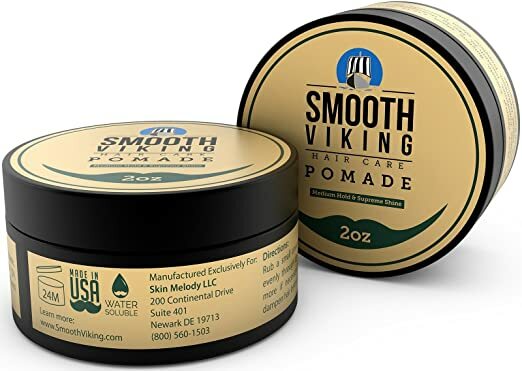 The Smooth Viking hair care pomade is water-based pomade that has been formulated to provide your hair with that extra boost. This is on the list of best pomade for men as it helps you in achieving that "so much a trending" sleek and dapper look. The primary ingredients of Smooth Viking hair care pomade include Zemea® Propanediol, PEG-40 Hydrogenated Castor Oil, and Ceteth-20. Zemea® Propanediol is an ingredient primarily used in hair care products and cosmetic products as it plays the role of being a natural, preservative-boosting humectant. It brings in that element of high performance to any pomade and ensures better styling. It also helps in improving hair and scalp moisturization and is a 100% biobased solvent. This simply means that it will not harm your hair in any way. Ceteth-20 is a type of waxy liquid or solid that helps in forming emulsions. They also enable proper cleaning of hair by ensuring water is able to mix with oil. It has strong surfactant and cleansing properties. Hydrogenated Castor Oil plays an important role in strengthening hair roots and scalp. It also increases hair growth, provides deep conditioning to hair and scalp, and makes hair fuller and shinier. This pomade is available in a water-based blend that ensures maximum sleekness, shine, and control of any type of hair. If you have been wondering how to get that salon style look and feel when it comes to hair pomades then here is one that just fits the profile. 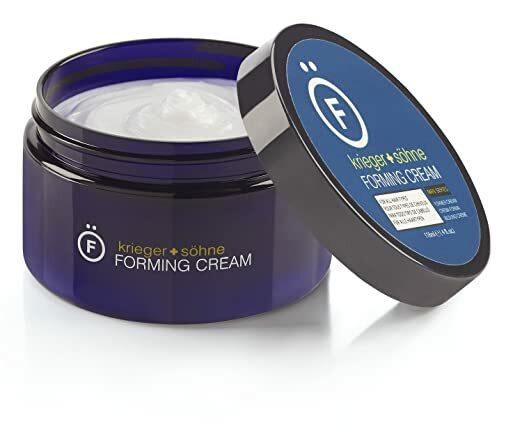 The krieger and söhne premium forming cream is really strong pomade that will ensure your hair style remains in place even if you are going through one of the most rigorous workout sessions! No wonder, it has made to this list of best pomade for men. The Krieger and Söhne premium forming cream contains a concoction of several natural or herbal extracts that are meant to be healthy for your hair and scalp as well. One such ingredient is hydrolyzed rice protein. This is considered to be a boon for those who have been thinking of ways to add volume to their hair. Research has indicated that hydrolyzed rice protein can actually help in increasing your total hair volume by as much as 32%. It is a soluble vegetable protein that has been extracted from Orysa Sativa or rice bran and hence completely organic. There is another natural ingredient in this best pomade for men and that is Trigonella Foenum Graecum or fenugreek. It is an annual plant that is cultivated worldwide and is most commonly referred to as herb. It is a rich source of protein and plays an important role in removing dandruff from hair and scalp. It is also known to reduce hair loss effectively. 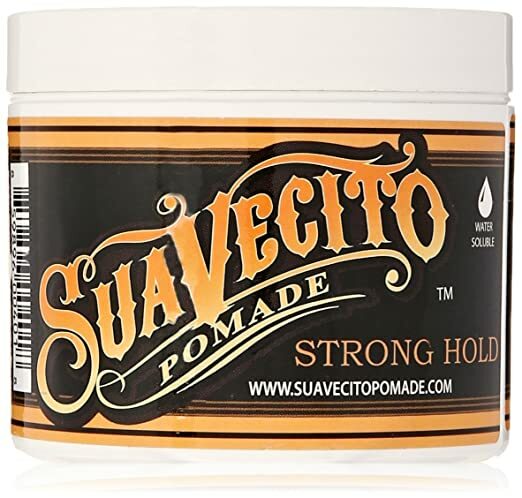 The Suavecito pomade firme hold is one of the best water based pomades out there in the market today. As the name suggests, it provides a strong and firm hold that maximum styling flexibility. This one is as good as the original ﻿﻿water soluble ﻿﻿﻿﻿pomade except for the fact that it brings in a lighter brown coloring. This is considered as one of the best pomade for men because after application, it is quite soft as well as easy to comb. Check it out on ! One of the primary ingredients of the Suavecito Pomade firme hold is Peg-8 Beeswax. This Beeswax is basically a self-emulsifying wax, which is produced via the process of etherification of free fatty acid in beeswax. Beeswax is also known as Cera Alba and it is a completely organic form of wax. The wax is created by honey bees that belong to the genus Apis. Beeswax is quite beneficial for people with dreadlocks. The good news is that it goes a long way in ensuring the proper maintenance of dreads. The Peg-8 Beeswax is an ingredient that displays a wide pH range tolerance and is also compatible several different types of oils. Suavecito pomade original also contains another highly effective ingredient called peg 40 hydrogenated castor oil. This oil is amber colored, and considered as a polyethylene glycol derivative. The primary function of this castor oil is that of a surfactant, an emulsifier, and parfum or fragrance ingredient. The Uppercut Deluxe pomade is a water soluble product that comes with a high degree of firmness. The reason why this pomade is considered one of the best pomade for men is because it is inspired by the classic 1950’s barbershop and the founder Willy “Uppercut” O’Shea. This modern day pomade has been created focusing on a more traditional approach towards men’s grooming. The primary ingredients in the Uppercut Deluxe pomade include PEG-40 Hydrogenated Castor Oil, Ceteareth 25, and Lanolin. Ceteareth 25 dissolves with ease in water and is non-ionic polyoxyethylene ether of different types of higher saturated fatty alcohols like stearyl or cetyl alcohol. Its primary property is that of being a universal emulsifier and it is compatible with variety of oils. ceteareth-25 also possesses a higher degree of thickening and gel-forming properties. Lanolin is most commonly known as wool grease or wool wax. It is a natural wax that is most often a result of sebaceous gland secretions by wool-bearing animals like sheep. One of the most important properties of lanolin is that it has the ability to trap water and thus acts as a great moisturizer. Lastly, hydrogenated castor oil when used in pomades acts as an anti-humidity agent and also promotes the growth of thicker hair. The Uppercut Deluxe pomade provides a medium to high hold and gives a great layered medium backwards comb hairstyle. 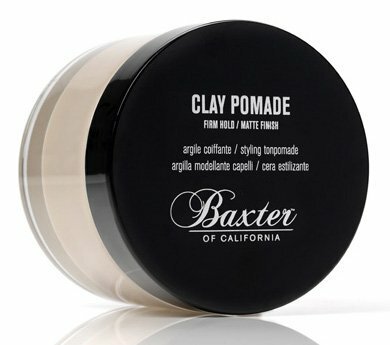 If you have been searching for a best men's pomade that provides raw strength when it comes to holding your style then the Baxter of California clay pomade does just that. It is a "Men's Health" award winner and hence on this list of best pomades for men. The Baxter of California clay pomade is an interesting mix of several natural oils including Foeniculum Vulgare (Fennel) Oil, Citrus Medica Limonum (Lemon) Peel Oil, and Salvia Officinalis (Sage) Oil. Foeniculum Vulgare Oil of fennel seed oil is considered to possess medicinal properties that are great for hair. It plays an important role in providing nourishment to your hair and preventing hair breakage and reducing hair loss. It also aids in the elimination of dandruff. Lemon peel oil is another natural ingredient that is considered a great natural remedy for hair. It massages the scalp, moisturizes it, and aids with the process of healthy hair growth. Sage or Salvia Officinalis is a herb that helps in the regulation of sebum production by your scalp. It is also being used for ages as a highly effective topical treatment for graying of hair. This is one of the best pomades for men as it contains the combination of beeswax and clay, which helps in delivering a strong all-day hold. A pomade launched by the design house of woody's, it surely goes a long way in defining hair styles. 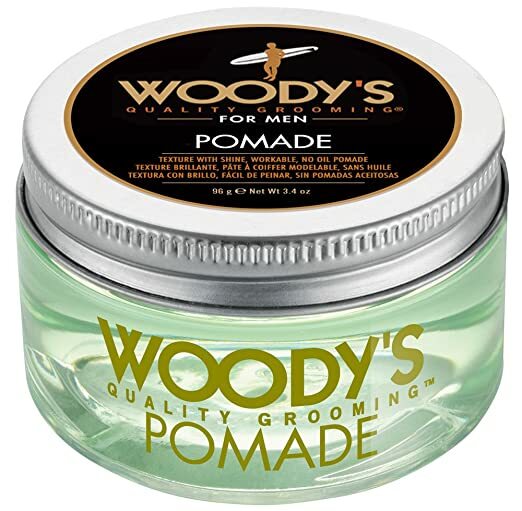 The almost transparent Woody's pomade for men comes with a subtle light green tint and an effective hold, which makes it one of the best hair pomade for men. This men's pomade from the design house of woody's contains plenty of natural ingredients apart from beeswax. One of the primary natural ingredients is Rosmarinus Officinalis (Rosemary) leaf extract and has been in use since the ancient period. Rosemary is a powerful herb and plays an important role in stimulating hair growth. It can also be used for treatment of dandruff as well as dry scalp. It also prevents baldness and slows down graying of hair. This ingredient in itself makes the Woody's pomade for men a great hair styling and hair care product. The second natural ingredient in the Woody's pomade for men is Zingiber Officinale (Ginger) root extract. So, what exactly does ginger do? It plays the key role of providing essential vitamins and minerals to your hair and scalp and this further promotes good hair health as well as growth. Ginger has natural antiseptic properties and this helps in fighting dandruff and protecting your hair and scalp from drying up. The Zeus original pomade for men is a grooming solution that really knows how to stand apart. This definitely deserves to be on the list of best pomade for men thanks to the variety of natural ingredients that it contains. 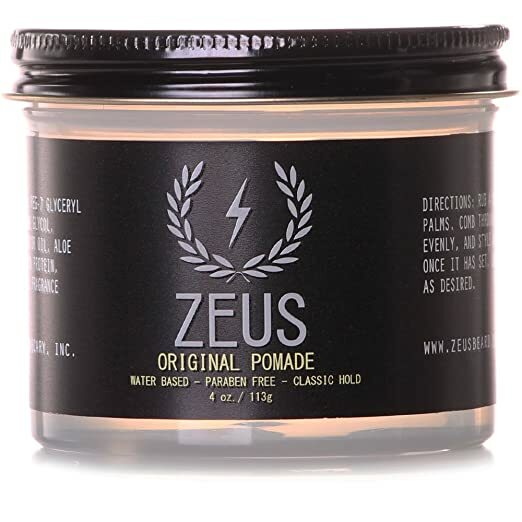 The two most important natural ingredients of the Zeus original pomade for men are Jojoba Wax and Keratin Protein. Jojoba wax is extracted from the nuts of the plant Simmondsia chinensis and it is native to Southwestern North America. It is often known as deer nut, goat nut, wild hazel, pignut, and even quinine nut. It is the jojoba nut that contains wax, which has been extracted to be used in the Zeus original pomade for men. It comes with its own bag of benefits for your hair like enriching hair follicles and scalp, so that hair growth is healthy. When it comes to hair styling, jojoba wax ensures facilitation of a variety of hair styles and holds them for longer periods of time. The second ingredient is keratin protein. Keratin is actually a naturally occurring fibrous structural protein and is a key structural component of your hair. Keratin protein present in the Zeus original pomade for men provides the much needed protein to your hair and as a result increases hair shine. It also plays a key role in stimulate cell and hair growth. Hair styling is actually an extremely personal choice but these pomades are the best mens hair pomade out there in the market. They work with a variety of hair types and offer several hair care benefits as well. These are some of the best pomades for men are definitely worth a try!